I’ve been a little sick lately, which left me with very little energy and appetite. Yesterday morning, feeling a little better, and craving something clean and healthy, I looked at my Pinterest boards for inspiration. This stunning picture of bright pink grapefruit segments set in a shallow pool of creamy buttermilk dressing was all I needed to head back into the kitchen. This breakfast salad comes together so easily: you segment a grapefruit,* shake together the ingredients for the dressing, and you’re ready to go. 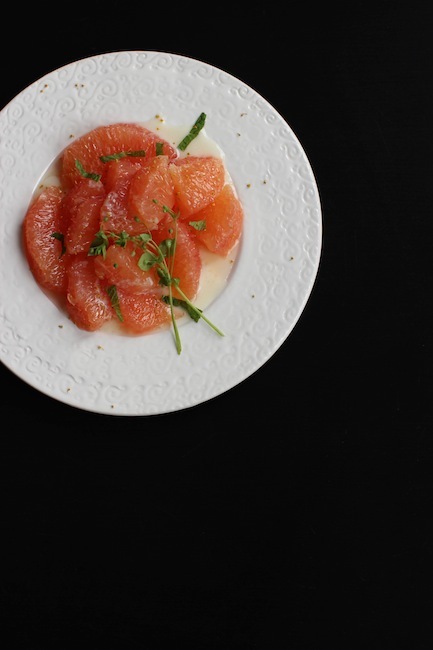 But the flavors make this extra special- the buttermilk dressing, tangy and slightly tart from the addition of limes, is mellowed out by maple syrup; it plays nicely with the grapefruit’s acidity, creating a dialogue rather than drowning it out. 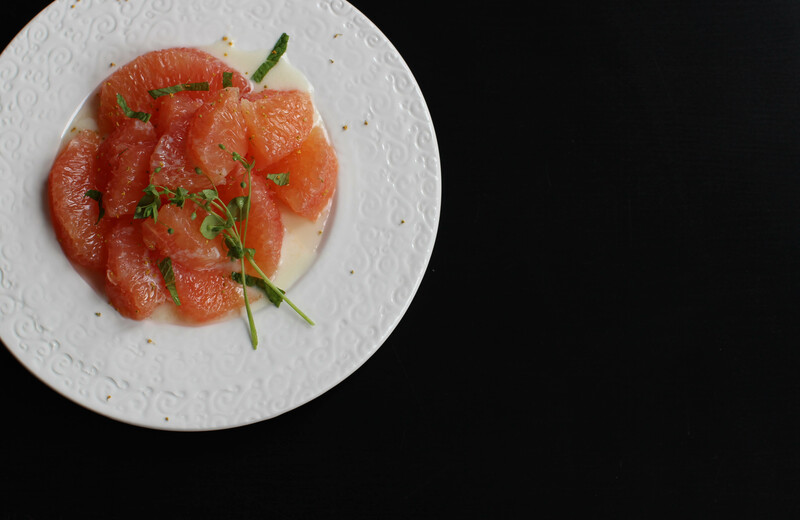 The grapefruit segments are doused with the milky dressing, and then topped with festive ribbons of mint and a sprinkling of fennel pollen, which makes a fun and surprising addition, tying the dish together with intensely floral notes. -how beautiful are these chocolate covered Matzoh with candied kumquats and toasted coconut?! -and 100 Matzoh recipes (yes, I realize it’s like the end of Passover already). 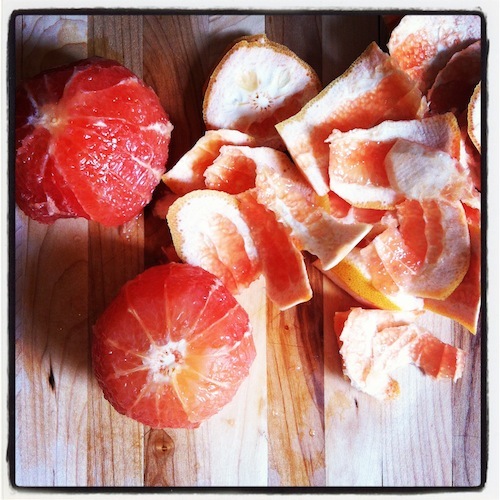 Segment your grapefruit,* and slice each piece in half. Combine all of the ingredients for the buttermilk dressing in a jar, and shake well. When you are ready to eat, place the grapefruit segments on two plates, and spoon some dressing over each (you’ll have a little left over). Garnish with mint, and sprinkle with fennel pollen. Enjoy! *Here’s a short how-to video on segmenting grapefruit. hmmm…interesting. I admit, these are definitely not flavours that I would think of putting together, but your description of the taste has piqued my interest! I made this for breakfast again and again last week- I kept on craving the flavors! hope you try it! I hope you feel better soon!! Beautiful recipe and gorgeous photos!! Thank you so much (on all counts)! Such an unbelievably gorgeous photo and recipe! I can’t wait to try it! very simple and wonderful dish………..keep posting like this we can make something simple.